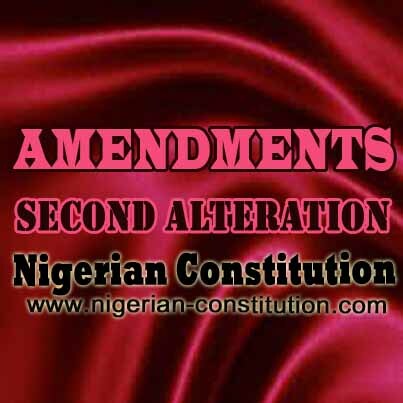 An Act to alter the provisions of the Constitution of the Federal Republic of Nigeria, 1999 and the Constitution of the Federal Republic of Nigeria (First Alteration) Act, 2010; and for related matters. 1. The provisions of the Constitution of the Federal Republic of Nigeria 1999 (in this Act referred to as the “Constitution”) and the provisions of the Constitution of the Federal Republic of Nigeria (First Alteration) Act No. 5 2010 (in this Act referred to as the “First Alteration Act”) are altered as set out in this Act. 2. Section 5 of the First Alteration act is altered in paragraph (b) by substituting for the words “one hundred and fifty days and not later than one hundred and twenty days before” in line 2 and 3, the words “ one hundred and fifty days and not later than thirty days before”. 3. Section 10 of the First Alteration act is altered in paragraph (b) by substituting for the words “one hundred and fifty days and not later than one hundred and twenty days before” in lines 2 and 3, the words “one hundred and fifty days before”. 4. Section 11 of the First Alteration Act is altered in paragraph (b) by substituting the words “one hundred and fifty days and not later than one hundred and twenty days before” in lines 2 and 3, the words “one hundred and fifty days and not later than thirty days before”. 5. Section 17 of the First Alteration Act is altered in paragraph (b) by substituting the words “one hundred and fifty days and not later than one hundred and twenty days before” in lines 2 and 3, the words “one hundred and fifty days and not later than thirty days before”. “(1) The Supreme Court shall have jurisdiction, to the exclusion of any other court of law in Nigeria, to hear and determine appeals from the Court of Appeal. (f) such other cases as may be prescribed by an Act of the National Assembly”. (2) in the hearing and determination of an election petition under paragraph (a) of subsection (1) of this section, the Court of Appeal shall be duly constituted if it consists of at least three Justices of the Court of Appeal. (ii) the term of office of any person has ceased or the seat of any such person has become vacant. (2) The National Assembly may confer jurisdiction upon the Court of Appeal to hear and determine appeals from the decision of any other court of law or tribunal established by the National Assembly. (3) The decisions of the Court of Appeal in respect of appeals arising from the National and State Houses of Assembly election petitions shall be final”. (b) Any person has been validly elected as a member of the House of a Assembly of a State. (2) There shall be established in each State of the Federation an election tribunal to be known as the Governorship Election Tribunal which shall, to the exclusion of any court or tribunal, have original jurisdiction to hear and determine petitions a to whether any person has been validly elected to the office of Governor or Deputy Governor of a State. (3) The composition of the National and State Houses of Assembly Election Tribunal and the Governorship Election Tribunal, respectively shall be as set out in the Sixth Schedule to this Constitution. (4) The quorum of an election tribunal established under this section shall be the Chairman and one other member. (7) An appeal from a decision of an election tribunal or Court of Appeal in an election matter shall be heard and disposed of within 60 days from the date of delivery of judgment of the tribunal or Court of Appeal. 1. (1) A National and State Houses of Assembly Election Tribunal shall consist of a Chairman and two other members. (2) The Chairman who shall be a Judge of a High Court and the two other members shall be appointed from among Judges of a High Court, Kadis of a Sharia Court of Appeal, Judges of a Customary Court of Appeal of the State or the President of the Customary of Appeal or members of the judiciary not below the rank of a Chief Magistrate. (3) The Chairman and other members shall be appointed by the President of the Court of Appeal in consultation with the Chief Judge of the State, the Grand Kadi of the Sharia Court of Appeal of the State or the President of the Customary Court of Appeal of the State, as the case may be”. 11. This Act may be cited as the Constitution of the Federal Republic of Nigeria (Second Alteration) Act, 2010. This Act further alters the Constitution of the Federal Republic of Nigeria, 1999 and the Constitutions of the Federal Republic of Nigeria (First Alteration) Act, 2010 among other things to provide for new timelines for the conduct of national elections, by the Independent National Electoral Commission.